Before we get started, keep in mind that WP Shopify and WP Shopify Pro are separate, independent plugins. Therefore, you should never have both activated at once. You'll want to either use one or the other. Also rest assured that the upgrade process will not remove any content you may have added, including synced Shopify data, updated settings, etc. 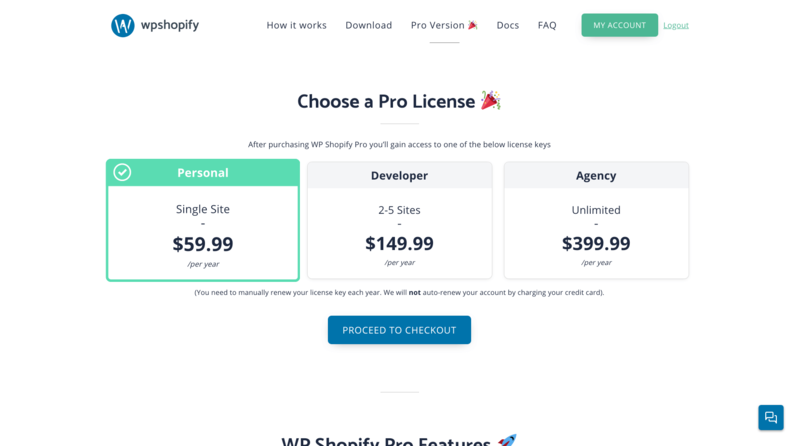 Before you can start using WP Shopify Pro you must first purchase a license key. Sign in to your WP Shopify account and download the WP Shopify Pro plugin. You can also find this download link within the welcome email sent to you. Before you install and activate the Pro version, open your WordPress dashboard and deactivate the free version. Make sure to do this before installing the Pro version or you may get errors. Once the free version is deactivated, open your WordPress dashboard and install the plugin by going to Plugins -> Add New. Now that the plugin is installed click "Activate" to finish the installation. After activating the Pro version, the free version should automatically be deactivated. You can now delete it. Lastly, head over to the Updates tab located under WP Shopify -> Settings and add your license key to continue receiving plugin updates.